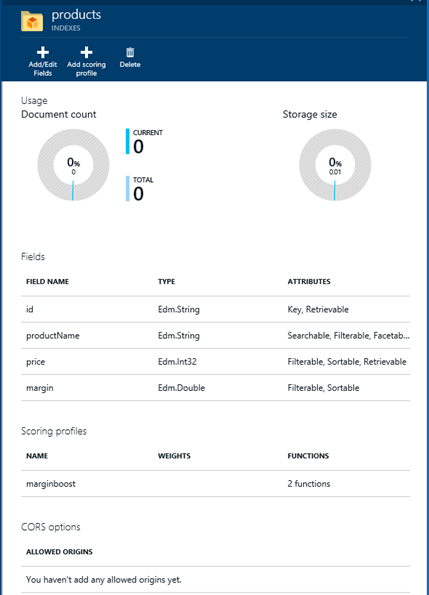 I’m excited to announce the public preview of our new Azure Premium Storage offering. 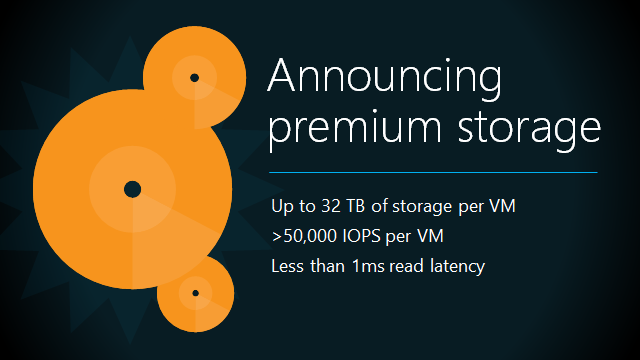 With the introduction of the new Premium Storage option, Azure now offers two types of durable storage: Premium Storage and Standard Storage. Premium Storage stores data durably on Solid State Drives (SSDs) and provides high performance, low latency, disk storage with consistent performance delivery guarantees. Premium Storage is ideal for I/O-sensitive workloads - and is great for database workloads hosted within Virtual Machines. You can optionally attach several premium storage disks to a single VM, and support up to 32 TB of disk storage per Virtual Machine and drive more than 50,000 IOPS per VM at less than 1 millisecond latency for read operations. This provides a wickedly fast storage option that enables you to run even more workloads in the cloud. Using Premium Storage, Azure now offers the ability to "lift-and-shift" more demanding enterprise applications to the cloud - including SQL Server, Dynamics AX, Dynamics CRM, Exchange Server, MySQL, Oracle Database, IBM DB2, and SAP Business Suite solutions. Premium Storage is now available in public preview starting today. To sign up to use the Azure Premium Storage preview, visit the Azure Preview page. Durability of data is of utmost importance for any persistent storage option. Azure customers have critical applications that depend on the persistence of their data and high tolerance against failures. Premium Storage keeps three replicas of data within the same region. In addition, you can also optionally create snapshots of your disks and copy those snapshots to a Standard GRS storage account - which enables you to maintain a geo-redundant snapshot of your data that is stored at least 400 miles away from your primary Azure region. You can learn more about Premium Storage disks here. To sign up to use Premium Storage, go to the Azure Preview page, and sign up for Microsoft Azure Premium Storage service using your subscription. 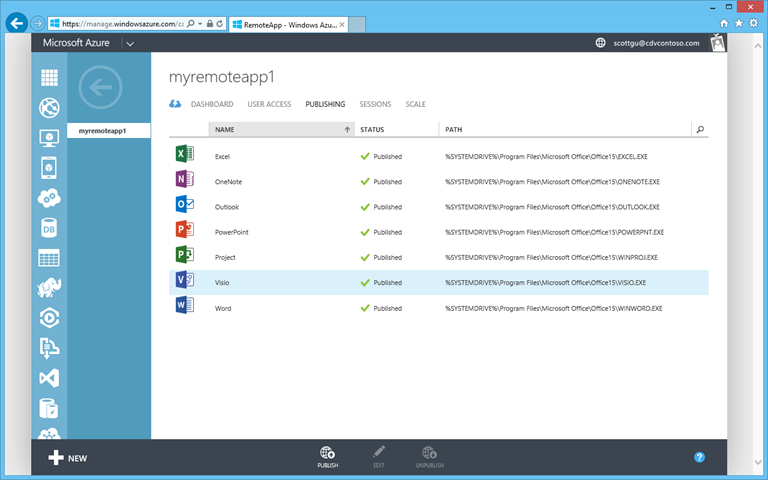 I’m excited to announce the general availability of Azure RemoteApp. Using Azure RemoteApp, you can deploy Windows desktop applications in the cloud, and provide your users with an intuitive, high-fidelity, WAN-ready remote application experience. Users can use the cloud-hosted Windows applications you enable on their phones, tablets, or PCs - including Windows, Mac, iOS and Android based devices. We are delivering RemoteApp with a super competitive price - you can host your user's applications in the cloud for just $10/user/month. With today’s release, Azure RemoteApp is backed by an SLA and supported by Microsoft Support, offering the full scalability and security of the Azure cloud. Setting up RemoteApp is easy. 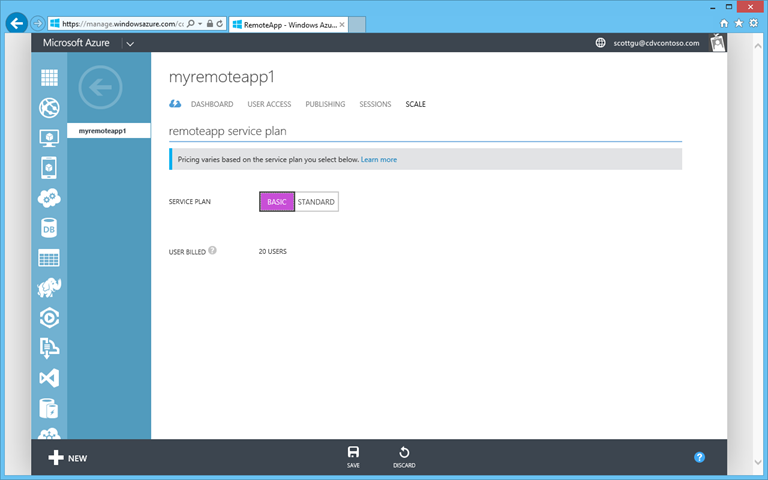 In the Azure Management Portal, select NEW -> App Services -> RemoteApp -> Quick Create. Pick a name, region, select the scale configuration plan you want to use, pick one of the standard template images, and click OK. When you do this for the first time, your 30-day free trial will also start. This is a fully featured trial, available to all Azure customers. Once enabled, your users can quickly and easily connect to the applications you host in Azure. They can use Windows, Mac, iOS and Android devices to connect to the RemoteApp service - enabling you to use Azure to run your Windows desktop applications anywhere in the world, on any device. Many business-critical Windows applications rely on on-premises infrastructure such as identity and machine management, and require access to on-premises databases and resources. Azure RemoteApp provides a hybrid deployment model that supports all of these scenarios. Hybrid Management: In a hybrid RemoteApp collection, the VMs which host your applications are joined to your AD domain. Therefore, you can use on-premises management tools like Group Policy, System Center, and many other enterprise management tools that rely on AD membership. Federated Identity: You can use Azure Active Directory integrated with your on-premises AD and your users can logon with their familiar corporate identities. When the Windows applications starts, it is running in a fully domain-joined session, with the usual integrated authentication capabilities of a Windows domain. Hybrid Networking: Windows applications in a hybrid RemoteApp collection can seamlessly access on-premises data and resources. This capability is built on Azure Virtual Networking with site-to-site VPN, providing cloud-premise virtual network connectivity. In the future, RemoteApp collections will support full range of Azure Networking capabilities, including ExpressRoute. With today's general availability release, we are offering two scale configurations: BASIC and STANDARD. BASIC is intended for lighter, task-worker use cases, such as a single productivity application or a data-entry frontend to a line of business system. STANDARD is intended for typical productivity use cases such as using Outlook, Word, Excel and other knowledge worker line of business and productivity applications. 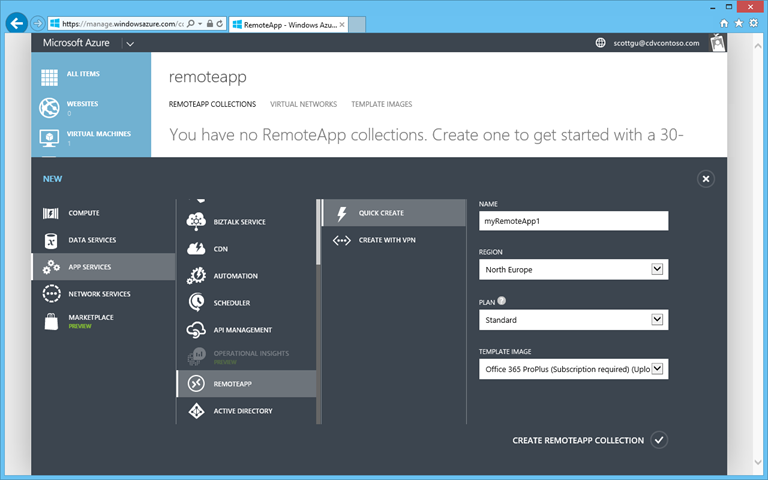 You can select the scale configuration for your RemoteApp collection while creating it. If you want to change it later, you can do so using the SCALE tab. Your applications and settings and your user data remain intact through this change. We are making the RemoteApp service available at a very attractive, affordable price. You can host a line of business Windows application for as little as $10/user per month using the BASIC configuration. At the STANDARD level, you can host your users’ entire productivity workspace for just $15/user per month. A variety of resources are available on the RemoteApp overview page. You can also download the client for your device and take a test drive. Finally, RDV Team blog discusses today’s new features in more detail. 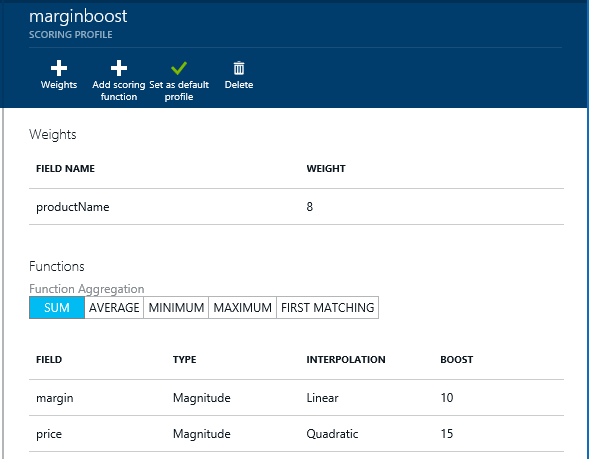 Today we are making available a preview of the next-generation release of our Azure SQL Database service. We announced some of the preview's new features earlier in November. Today's release delivers near-complete SQL Server 2014 engine compatibility and even better performance. Our internal benchmark tests (using over 600 million rows of data) show query performance improvements of around 5x with today's preview relative to our existing Premium Tier SQL Database offering and up to 100x performance improvements when using the new In-memory columnstore technology now supported with today's preview release. Better management of large databases. We now support heavier database workload management with parallel queries, table partitioning, online indexing, worry-free large index rebuilds with the previous 2GB size limit removed, and more alter database commands. Support for more programmability capabilities: You can now build even more robust applications with CLR, T-SQL Windows functions, XML index, and change tracking support. Up to 100x performance improvements with support for In-memory columnstore queries for data mart and analytic workloads. New S3 performance level: Today's preview introduces a new pricing option for SQL Databases. The new "S3" performance tier delivers 100 DTU of performance (twice the DTU level of the existing S2 tier) and all of the features available in the Standard tier. 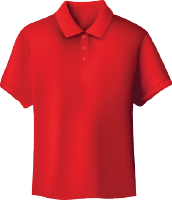 It enables an even more cost effective way to run applications with higher performance needs. You can read more about the enhancements in today's preview on the preview getting started page. 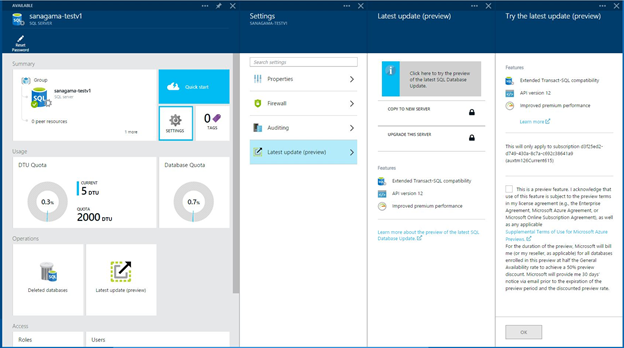 To use today's preview, you can navigate to the SETTINGS part on the SQL Database blade in the Azure Preview Portal and upgrade to use the preview. Try our the new features and give us your feedback! I’m very excited to announce the General Availability of Live Channels Media Streaming support. Live Channels with Azure Media Services is the live services backbone that broadcasters such as NBC Sports have used to deliver live online media streamed events such as English Premier League, NHL hockey, Sunday Night Football. A dozen international broadcasters also used it to seamlessly deliver live media streaming coverage of the 2014 Sochi Winter Olympics and 2014 FIFA World Cup. You can now use Live Channels to stream events of your own - and scale to literally millions of users watching them. Today's general availability release is backed by an enterprise-grade Service-Level Agreement (SLA) for all customers. For more information on functionality and pricing, visit the Getting Started with Live Streaming blog post, the Media Services webpage or Media Services Pricing webpage, or the Live Streaming MSDN section. 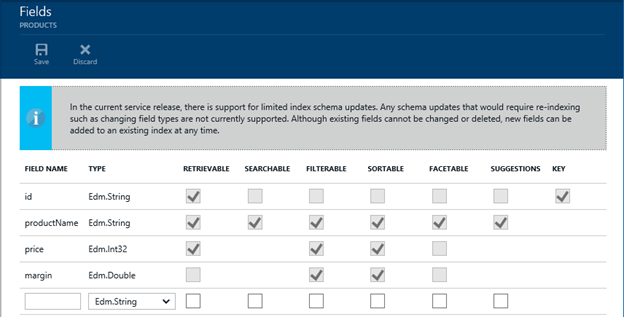 I am happy to announce a number of highly requested features available today in Azure Search. Azure Search provides developers with all of the features needed to build out search experience for web and mobile applications without having to deal with the typical complexities that come with managing, tuning and scaling a real-world search service. Helping developers setup and manage their services quickly and easily is a key goal of the Azure Management Portal. 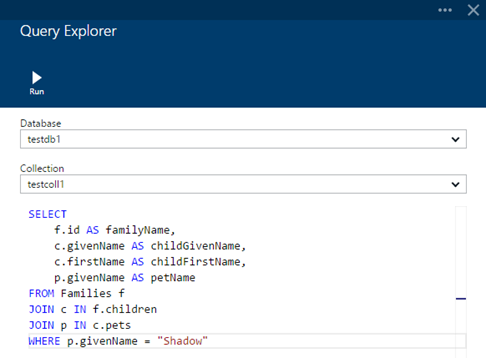 Today's release adds several new capabilities to the Azure Search support in the portal that makes it even easier to get started with Azure Search and reduce the need to write code. Index tuning is another enhancement now supported in the portal user interface. Boosting relevant items not only provides a better search experience, it also helps you achieve business objectives. For example, if you are searching a product index, you might want to boost documents where the result was found in the product name, as opposed to another document where the result was found in the product description. Or you may wish to use a scoring function that allows you to boost items that have high star ratings or that provide higher margins. With today’s release, Azure Search now has support for 27 languages. This allows Azure Search to accommodate the unique characteristics of a given language, enabling word-breaking and text normalization to work as expected for each language. Part of this enhancement includes support for stemming in the relevant languages, reducing words to their word stems. For example, you can search for the word “runs” and find documents that say “run” or “running”. When creating an index you can choose to include content from multiple languages, allowing you to search and return results based on the chosen language of your user. For more information, you can visit the Language Support page. Over time, we will continue to enhance multi-language support to include additional languages. Last but not least, we’ve introduced a new Azure Search Management REST API that allows you to perform common administrative tasks, such as creating new services, and scaling services to allow for additional storage or higher query-per-second rates. You can see a sample of how to use this Management API at CodePlex. DocumentDB is a NoSQL document database service designed for scalable and high performance modern applications. DocumentDB is delivered as a fully managed service (meaning you don’t have to manage any infrastructure or VMs yourself) with an enterprise grade SLA. These features make it even easier to get started and explore DocumentDB. In the new blade that opens, click the browse button to open a file explorer and select 1 or more JSON documents to upload. 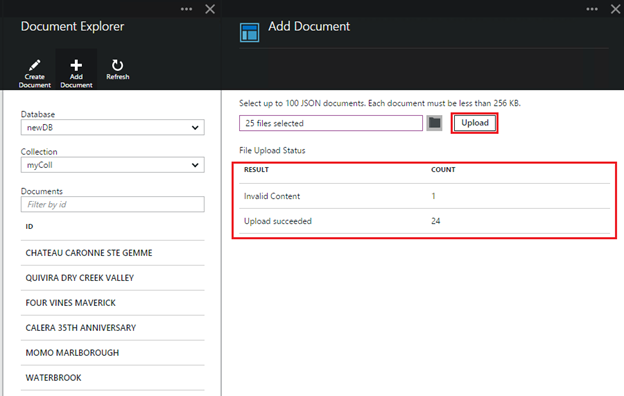 Note that Document Explorer currently supports up to 100 JSON document files in a single upload operation. Once you’re satisfied with your selection, click the upload button. The documents will automatically be added to the Document Explorer grid and aggregate results will be displayed as the upload operation is in progress. Once the operation has completed, you can select up to another 100 documents to upload without having to close the Add Document blade. 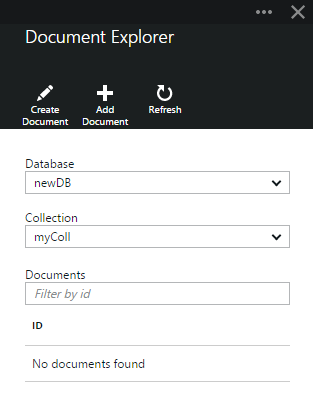 This makes it easy to import data into your DocumentDB databases. We’ve also enabled basic keyword and value highlighting within Query Explorer. This makes it even easier to experiment and test queries against your NoSQL databases. Please send us your feedback and suggestions on the Microsoft Azure DocumentDB feedback forum. If you haven’t tried DocumentDB yet, you can learn more about how to get started here. I’m excited to announce the General Availability of the Disaster Recovery (DR) to Azure for Branch offices and SMB feature in our Azure Site Recovery (ASR) service. Today's new support enables consistent replication, protection, and recovery of Virtual Machines directly in Microsoft Azure. With this new support we have extended the Azure Site Recovery service to become a simple, reliable & cost effective DR Solution for enabling Virtual Machine replication and recovery between Windows Server 2012 R2 and Microsoft Azure without having to deploy a System Center Virtual Machine Manager on your primary site. These features builds on top of the Hyper-V Replica technology available in Windows Server 2012 R2 and Microsoft Azure to provide remote health monitoring, no-impact recovery plan testing and single click orchestrated recovery – all of this backed by an SLA that is enterprise grade. The Test Failover feature within Azure Site Recovery allows you to test your disaster recovery plans without impacting your production workload which ensures that you can perform periodic DR drills to meet your compliance objectives. You can connect to the virtual machine running in Azure via RDP after enabling the appropriate endpoints for the virtual machine running in Azure. A Planned Failover will do a shutdown of your on-premises machine, transfer all the last changes inside the virtual machine to Azure & then bring up an instance of the VM in Azure without any data loss. An Unplanned Failover is usually triggered when your on-premises site has been hit by an unexpected disaster. If you are looking for failing over a multi-virtual machine application, you can do so using the One-Click Orchestration using Recovery Plans feature available in Azure Site Recovery. Recovery plans make failover and failback from Azure easy and ensure that you meet your Recovery Time Objectives (RTO) goals of your organization. Check out additional pricing or product information about Azure Site Recovery, and sign up for a free Azure trial and start using it today. Today's Azure update includes some great updates to Azure Active Directory. The Azure Active Directory Application Proxy allows you to make your on-premises web applications securely accessible to users who want to use them from the cloud - and enables you to authenticate access to them using Azure AD. You can do this without changing your applications and without having to change your DMZ configuration. Just install a lightweight connector anywhere on your network and configure access to the application in your Azure Active Directory, and you can make your SharePoint, Outlook Web Access (or any other Web application that relies on Kerberos) available to users outside your corporate network. With today's release we added support for Kerberos Constrained Delegation. Now, once a user has authenticated to Azure Active Directory, the Azure Active Directory Application Proxy can automatically authenticate users to your on-premises application. With the new Password Writeback support in Azure AD Sync, you can now configure your Active Directory system so that any time a user or administrator changes a password in Azure AD, the new password is also written back to your on-premises Active Directory as well. So, for example, when a user forgets their password to your on-premises AD, they can reset their password using the Azure AD password reset service we provide in the cloud, and then use their new password to sign on to your on-premises AD. This makes it easier for organizations to enable a variety of self-service IT and password reset features to their employees and partners. With today's release we’re also introducing preview support that enables you to configure security questions for password reset scenarios. This enables users to register their answers to secret questions, and then use those answers to prove who they are when they go to reset a forgotten password. With today's release we are introducing the preview of functionality that lets you configure password-based single sign-on for any web application that has an HTML sign-in page, even for applications that are not in the Azure AD Application Gallery. You can also add any links to your users’ Azure AD Access Panel, such as deep links to specific SharePoint pages, or to web apps that use Active Directory Federation Services. We now support the ability to purchase Azure Active Directory Premium online at the Office 365 commerce catalogue, where you can purchase Azure AD Premium licenses for as many users as you want. You can then easily manage your Azure Active Directory by navigating to http://aka.ms/accessAAD or through the Office administration portal. To learn more about these new capabilities and how you can start using them, read Alex Simons’ post on the Active Directory Team Blog. Today’s Microsoft Azure release enables a ton of great new scenarios, and makes building applications hosted in the cloud even easier. If you don’t already have a Azure account, you can sign-up for a free trial and start using all of the above features today. Then visit the Microsoft Azure Developer Center to learn more about how to build apps with it. We now seem to have both S3 and P1 at 100 DTUs, but with very different prices, which seems odd. Even though P1 offers numerous other/improved features over Standard Tier, the price difference seems very large given the "DTU" equality. Further, it is stated that P2 and P3 are getting I/O improvements, but there is no mention of changes to the DTUs to these tiers. If actual performance (i.e. IOPs) is changing, then presumably DTUs should be increased (unless the definition of a DTU itself is changing). I am a bit confused. The story here seems incomplete. Can you help clarify things? So can we now export on premise SQL server databases to SQL azure in 1 click? This has so far been your Achilles heel. Please add possibility to pay by Prepaid Visa or Mastercard card. Did you cut IO, DTU or CPU in the business tier with this release? Is it a temporary problem or a permanent change? I've now performed a few quick performance tests on the V12 Preview and have found the performance improvements are indeed significant. I hope these performance levels remain into GA.
Great upgrades. Live Media Streaming will definitely be one of the most beloved services by the clients in the media industry. Great post. I like your post. Awesome compatibility! thanks for the update man! How about adding an email hosting client? Sendmail is great if you want to spam the world. but for people who use azure as hosting for their sites with a custom domain name, having an email server in azure would certainly make it easier.